How many of you have gone on a business trip or vacation and crammed as much as possible in a suitcase (even just a carry-on to beat the baggage fees)? We’ll be going to the Cape for two weeks in August and we’re already talking about taking two cars to hold all our stuff we want to bring. And I don’t know how many business trips I’ve been on that I’ve come home realizing I didn’t need that extra pair of shoes or projects to work on “in my free time.” Through the years I have learned to travel light, bringing just what I need, but I am always afraid as I leave the house with my carryon that I’ve forgotten something, so I jam in some last minute extras. The invitation and packing directions for Jesus’ mission trip in today’s Gospel promise an odd combination of experiences. Imagine that you are receiving these instructions from him for your next trip––either business trip or pleasure. He demands that you travel light, drastically under packing; without purse, bag, or sandals; certainly no luggage, laptop, or smart phone. Perhaps you can borrow clothes from your hosts along the way or wash what you are wearing frequently in a nearby river or laundromat. There will be no bringing along snacks; perhaps you can mooch off the people you stay with. Put more delicately, you’ll be relying on the hospitality of the people you stay with to provide you with food. He sends you forth with the reminder that the work you are going to be doing will be very hard; it’s a big job and not enough people have signed up to do it. You are going to meet people who will be hostile to your efforts (like sheep amidst wolves) and you’ll find yourself in situations where you will experience rejection (so be prepared to wipe the dust off your feet and move on). If you’re in sales, you know what that’s like, right? Jesus is instructing those who will carry the proclamation forward. He is speaking to us, too. 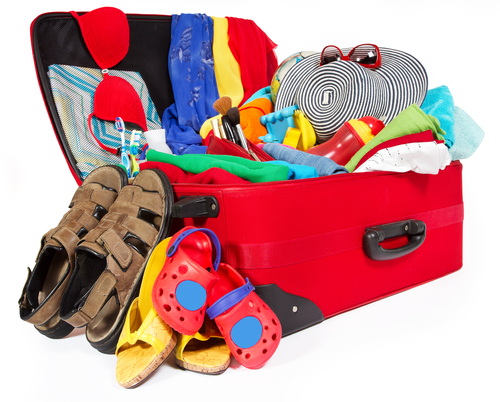 These directions on what to pack and what to leave at home clue us into the purpose of being a disciple of Jesus – a Christian on a mission trip to spread the Good News of Christ. Given that purpose, we are to leave all the necessary stuff at home, but make sure we bring along our faith and our courage. We are the ones, the seventy, sent out without purse, bag, or sandals. Seventy – like the numbers of elders chosen to share Moses’ spirit of prophesy and burden of leadership described in the Book of Numbers. Seventy, like the number of times time seven that Jesus’ followers are to forgive. Jesus sends out seventy as workers for the harvest, to proclaim that God’s rein has arrived, that Satan has not won. Jesus sends out seventy – a number of fullness and wholeness – to exercise authority over every spirit and every condition that oppresses God’s children, because time is running out. If we were to have read the final portion of scripture through to verse 24, we would have heard, “I tell you, many prophets and kings desired to see the things you are seeing, and they did not see, and to hear the things you are hearing, but did not hear it.” The world is hungry for peace, justice, compassion, and love to counter the senseless violence and hateful rhetoric that fills the air that we breathe. We are the ones given such a sense of urgency that we will not be able to stand and chat along the way. In traveling with nothing we can pay more attention, because Jesus’ message concerns us all. In traveling, we also need to travel in pairs and depend on the hospitality of the people we encounter. While we do not carry out own possessions, we do bring the blessing and peace of God to those who extend hospitality to us. We shouldn’t continue on seeking more prestigious or luxurious accommodations, but accept what has been given to us by our hosts. We are to be grateful to our hosts and content with what we have been provided. Today’s text is also about the relationship between us (those who are sent) and those who receive us (perhaps the strangers we encounter). Mutual responsibility and mutual vulnerability are our call. It may mean going out to speak out against injustice. It may be to help feed the hungry. It may be to walk alongside someone we don’t know well, just to listen. The seventy in Jesus’ time, and the seventy today aren’t a tiny group of folks sent out in our Sunday best. It’s you and me, and all of us who hears the call; we are to be the workers being sent out into the harvest for God. So before you go on your next trip or prepare for vacation, take your ego out of the suitcase, but make sure you pack your faith and your courage. Learn how to be present to those you meet. Bring comfort. Restore and renew vision. And be open to the hospitality of strangers. God will be with you. Thank you Sharon, for such a wonderful insight into this passage. Travel light, except for faith and love.